While the evil might of the Dark Lord Sauron swarmed out to conquer all Middle-earth, Frodo and Sam struggled deep into Mordor, seat of Sauron’s power. To defeat the Dark Lord, the accursed Ring of Power had to be destroyed in the fires of Mount Doom. But the way was impossibly hard, and Frodo was weakening. Weighed down by the compulsion of the Ring he began finally to despair. The awesome conclusion of J.R.R. 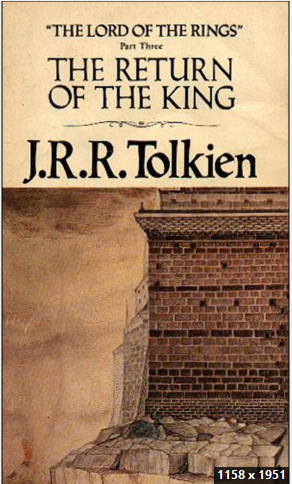 Tolkien’s The Lord of the Rings, beloved by millions of readers around the world. Concluding the story begun in The Hobbit, this is the final part of Tolkien’s epic masterpiece, The Lord of the Rings, featuring an exclusive cover image from the film, the definitive text, and a detailed map of Middle-earth. The armies of the Dark Lord Sauron are massing as his evil shadow spreads ever wider. Men, Dwarves, Elves and Ents unite forces to do battle agains the Dark. Meanwhile, Frodo and Sam struggle further into Mordor in their heroic quest to destroy the One Ring. The devastating conclusion of J.R.R. Tolkien’s classic tale of magic and adventure, begun in The Fellowship of the Ring and The Two Towers, features the definitive edition of the text and includes the Appendices and a revised Index in full. To celebrate the release of the first of Peter Jackson’s two-part film adaptation of The Hobbit, THE HOBBIT: AN UNEXPECTED JOURNEY, this third part of The Lord of the Rings is available for a limited time with an exclusive cover image from Peter Jackson’s award-winning trilogy.